Benzodiazepines are organic chemical substances, made of two carbon rings. Certain benzodiazepines can be used as drugs that increase the effect of the neurotransmitter GABA. The resulting drug has sedative effects. Depending on the drug, the effect may be stronger or weaker. The first benzodiazepine, chlordiazepoxide (Librium), was discovered accidentally by Leo Sternbach in 1955, and made available in 1960 by Hoffmann–La Roche. In general taking benzodiazepines is safe and effective in the short term. Longer term use is controversial: In the long term, the drug may become less effective and problems of dependency may show. Benzodiazepines may not be safe to be taken during pregnancy. They are not teratogens, which cause birth defects, but they may cause cleft palate in a small number of babies. 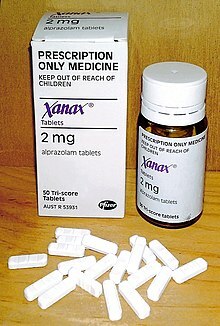 Benzodiazepines can be taken in overdoses and can cause dangerous deep unconsciousness. However, they are much less toxic than the drugs they replaced, the barbiturates. Death rarely results when a benzodiazepine is the only drug taken. When combined with other central nervous system depressants such as alcohol and opiates, the potential for toxicity increases. Benzodiazepines are commonly misused and taken in combination with other drugs of abuse. ↑ Fraser AD (1998). "Use and abuse of the benzodiazepines". Ther Drug Monit 20 (5): 481–9. doi:10.1097/00007691-199810000-00007. PMID 9780123. ↑ Charlson F, Degenhardt L, McLaren J, Hall W, Lynskey M (2009). "A systematic review of research examining benzodiazepine-related mortality". Pharmacoepidemiol Drug Saf 18 (2): 93–103. doi:10.1002/pds.1694. PMID 19125401. ↑ Longo LP, Johnson B (April 2000). "Addiction: Part I. Benzodiazepines--side effects, abuse risk and alternatives". Am Fam Physician 61 (7): 2121–8. PMID 10779253. http://www.aafp.org/afp/20000401/2121.html. ↑ Lader MH (1999). "Limitations on the use of benzodiazepines in anxiety and insomnia: are they justified?". Eur Neuropsychopharmacol 9 (Suppl 6): S399–405. doi:10.1016/S0924-977X(99)00051-6. PMID 10622686. This page was last changed on 10 March 2015, at 00:54.